As one of the major innovators in digital cameras over the last decade, it is somewhat ironic that Canon has been the last major maker to introduce a ‘mirrorless’ or hybrid model. The first of the new series, the EOS M is an easy-to-use entry-level camera unashamedly aimed at amateurs. The lack of a viewfinder optical or otherwise is an obvious omission, but the design objectives to produce a camera that was genuinely compact and yet built around the APS-C format sensor of the firm’s EOS Kiss/Rebel650D DSLRs were clear at the onset. 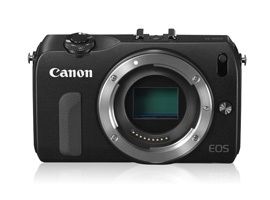 The fact that the EOS M adopts an 18-megapixel Hybrid CMOS AF system implemented by the EOS Rebel T4i/Kiss X6i/650D (depending on the locale) with Digic 5 image processor and a maximum sensitivity of ISO12,800, expandable to 25,600 suggest Canon feel comfortable with the low-light performance. As well as performing image capture this sensor performs contrast-detection AF like rivals but also boasts embedded pixels used specifically for phase-difference AF which allows faster focus detection during live view as well as continuous AF during movie capture. While not a new technology, (it is used by several cameras including the Nikon I system models, and current Sony NEX/Alpha series) the EOS 650D SLRs and EOS M are the first to feature it from the firm. Like rivals, Canon has had to redesign lens drive systems to accommodate the smooth autofocus required during AF tracking for movie capture, resulting in lenses with a STM designation. The EOS-M features a new lens mount requiring a new range of lenses, however the Mount Adaptor EF/EF-S to EOS M allows use of Canon’s FF and APS-C format lenses on the new camera. Other features of note include a touch sensitive rear LCD screen, continuous maximum shooting at up to 4.3fps at full resolution and a release time lag of just 0.05 seconds. A total sensor performance score of 65 places the EOS M in 79th place overall in the DxOMark rankings, just ahead of Canon’s most recent DSLR the EOS Rebel T4i/Kiss X6i/650D. This is predictable given the two are said to share the same sensor unit. The slight differences in the sensor performance (which is somewhat exaggerated by the number of competing cameras scoring similar results) can be attributed to tweaks in the image-processing pipeline rather than variations in sensor architecture. Remember these results relate to sensor performance only, and are not indicative of any other aspect of the camera’s capabilities. For a hybrid camera (aka mirrorless type) the results are good and it comes just within the top-ten models (at the time of publishing). However, it should be noted the EOS M follows just behind the older APS-C Sony NEX-5 and NEX-3 models, which have scores of 69 and 68 respectively, which are in turn behind the smaller 4:3 format Olympus OM-D and E-PM2. Sitting at the top above the new NEX-6 and Pentax K 01 with sensor scores of 78 and 79 respectively is the NEX-7 with a score of 81. Those two models likely share the same Sony 16MP sensor while the NEX-7 has an even higher 24MP resolution sensor, showing that higher resolution doesn’t routinely restrict dynamic range and color information or produce higher noise levels. It’s also worth bearing in mind that all of the Sony APS-C sensors have slightly larger surface area than the Canon imagers. With a value of 11.2 Evs and a Color Depth of 22.1 bits the EOS M has around one stop (1Ev) dynamic range and 0.5 bits less than the popular Olympus OM-D E-M5 / E-PM2 models and quite a significant 2.2 Ev and 2 bits less than the Sony NEX-7 at base sensitivity. Although the dynamic range of the sensor in the EOS-M is slightly disappointing, most enthusiasts will be adopting ND filters for their landscapes. Anything over 22 bits Color Depth is considered excellent, so we can’t really criticize there however, it must be said, files with more detail in the shadows and highlights is never a bad thing. If we look at the Sports (Low-Light ISO) scores, the EOS M fairs a bit better and comes 48th overall with a reasonable 827 ISO score. It matches the 4:3 OMD E-M5 and comes very close to the full-frame Leica M9 (at 884 ISO) but still a little behind the NEX-7 with its 1079 ISO threshold. The best in the hybrid camera group was the Pentax K01 at 1135 ISO. In real world use there’s not much between those figures. Canon’s best is the full-frame EOS 1DX with a score around the 2800 ISO mark. When we compare the EOS-M and EOS 650D directly, the scores are very close. Canon states the cameras share the same sensor and we see no reason to doubt that. The EOS-M’s slightly higher Sports and slightly superior Color Depth scores will be barely noticeable in real world use. The EOS-M is targeting compact camera users trading up, whereas the pricier NEX-6 with its manual controls and EVF is aimed at enthusiasts. However, in terms of sensors, the Canon adopts an 18MP imager, and the Sony a 16MP unit. Even with a lower pixel count the NEX-6 sensor performs similarly to the 24MP NEX-7, suggesting some sensor design differences between them but either of those two models’ sensors outperforms the Canon’s in each of our three Use Case Scores. The most revealing is the maximum 2Ev benefit in DR at base ISO, allowing users considerable leeway with exposure errors, but it’s fair to say the Canon sensor performs as well from ISO1600. The Sony NEX-6 uses a different, lower resolution sensor to the firm’s NEX-7 but the difference in dynamic range over the Canon’s sensor remains largely the same. By ISO1600, DR indistinguishable between them. The Canon sensor in the EOS-M also has slightly higher chroma (colour) noise than the Sony chip in the NEX-6. Our Color Sensitivty tests indicate a maximum of 2 bits at low ISO in favor of the Sony, that’s close to a one-stop improvement at base ISO. The Canon EOS-M can’t match the Sony NEX-6 for Color Depth (measured in bits) at any point in the ISO range except at ISO25600, meaning color noise levels are higher except at the maximum. In our third comparison, we’ve chosen the Nikon 1 J2, a camera that has been designed to appeal to a similar group of users. There’s a 10 point lead in the DxO Mark sensor scores to the EOS-M. But, when viewed in context, the Nikon 1 J2 adopts a 1-inch type BSI sensor that has a considerably smaller surface area than the Canon’s put it at a distinct disadvantage. Given the Nikon I J2 has a much smaller sensor than the Canon EOS-M you would expect the dynamic range to be lower. It is, but there’s not as much difference as you might expect. As a result, the EOS-M’s APS-C size CMOS sensor is a better performer; the smaller Nikon chip has both higher noise levels and a lower dynamic range. However, while the EOS-M has a one-stop advantage in our low-light ISO and color depth scores, the dynamic range of the Nikon is not far behind the Canon. Throughout the sensitivity range, the Canon EOS-M has consistently lower color artifacts (color noise) than the 1-inch type sensor in the Nikon 1 J2 . Canon was late to introduce a hybrid or mirrorless camera, but it was probably inevitable the firm would chose to revamp its three-year old APS-C sensor design to keep the body size to reasonably compact dimensions while at the same time offering good image quality. It doesn’t match the best sensors used by the Sony NEX hybrids by quite a margin in some instances but it outperforms the much smaller (by surface area) 1-inch type used in the Nikon 1 series. Those cameras are particularly compact, as indeed are the series 1 lenses, but the choice of APS-C sensor format means Canon can compete on equal terms with Sony and Samsung with regard to size. It remains to be seen, however, if Canon can vie on sensor performance. Should they decide to move away from their older 0.5 micron process generation and adopt state-of-the-art fabrication, advanced pixel sharing architecture and column-parallel ADCs in their APS-C (and FF) cameras, there’s every chance Canon can.